9,107 grt; 12,483 dwt; part-refrigerated. Operator: COSCO - China Ocean Shipping Co, Guangzhou, China. Built: 1964 by Mitsubishi Heavy Industries Ltd, Hiroshima, Japan. Yard no 167. Main engine: nine-cylinder, two-stroke Mitsubishi 9UEC75/150 of 12,822 bhp. Speed: 18.25 knots. Built for C F Sharp & Co Ltd, Manila, Philippines as DON ANTONIO (Liberian flag). 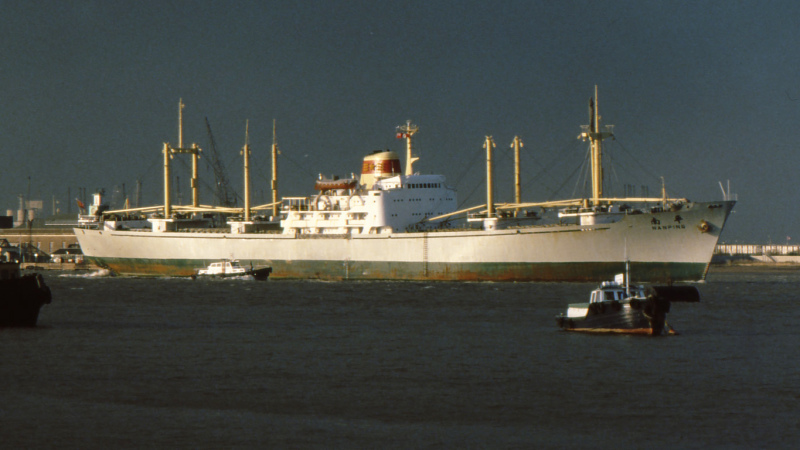 1972-to Yick Fung Shipping & Enterprises Ltd, Hong Kong as FLORES SEA. 1974-to Cosco as NAN PING (PRC flag). This photo has been shown 474 times since it was added to the site.